« Days 16-17: What Is Fresh and Green in Hamburg? You aren’t surprised, are you, that the people who start something called “Let’s Start Talking” find themselves in conversations with lots of people all the time about lots of different things. Would you like a quick look at our conversation itinerary? Hannover, Germany was our home for six years and where all three of our children were born. Along with two other couples, we moved here in 1973 to begin a new church plant. That church grew and thrived for 20 years, long after all of us Americans had left. 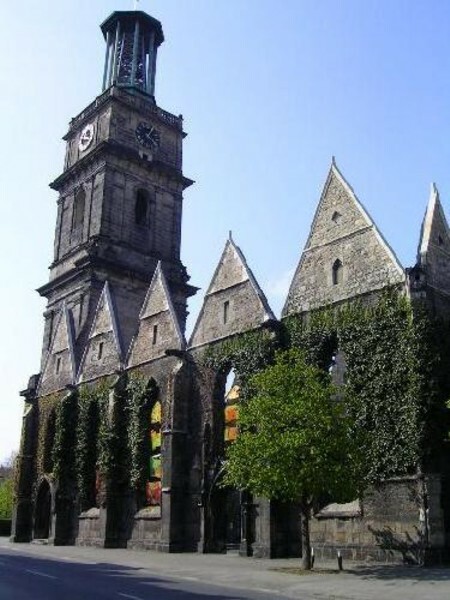 The Hannover church even helped in planting two other churches in Peine and Hildesheim, both cities about 30-45 minutes by autobahn from Hannover. In the mid to late 90s, the devil got into the Hannover church through divorce, immorality, petty jealousies and blew it completely apart. Many of the members have remained faithful and belong either to one of the offspring in Hildesheim and Peine, or they attend another church. Some seem to have completely abandoned their faith. Those who really suffered, however, were the children of the members. Even if we just have one day, Sherrylee and I have always made a point to keep the love and the conversations alive that we share with our brothers and sisters in this region. But, as you will see, the conversations can be gut-wrenching. “How are your kids?” The Hannover church was mostly young families, so there were lots of children. Today most of them are in their early 20s, marrying, finishing educational goals—and only a few of them are active believers! Most of those children do not attend church and do not appear to be living in any kind of faith. The ones who have chosen faith are spoken of almost as miracles—like God has been especially gracious to them. The others are all still held up to God in prayer by loving parents—at least by the parents who are themselves still believers. “What do you hear about _________?” Surprisingly, many from the disintegrated Hannover church still keep up with each other. Some have moved away, a few of the older members have died, and only a handful want nothing to do with those friends from the past. I believe that even these occasional relationships are remnants of the strong love that existed in the Hannover Gemeinde. “I feel betrayed by the people who abandoned their faith?” Those who so casually leave a church family probably have no idea that they cause real pain,–but they do, and it is a pain that can endure for years! “Why don’t those other people love me anymore just because I don’t worship with them? This conversation usually grows out of a longing for the intimacy that has been lost. Sometimes even those who have abandoned the community suffer from this loss of intimacy. It’s not unusual for them to blame those that they themselves rejected! How can I have a relationship with her when she is still living in sin? The broken mess that sin creates can be forgiven, but the consequences for relationships are very difficult to heal. The people can be redeemed, but the mess is often permanent—at least until Jesus comes and makes all things whole! We had several conversations this time about how Christians should respond to the enduring brokenness that sin leaves behind. Happily, we were able to have breakfast with Don and Cindy Roehrkasse and Kyle and Susan Bratcher who lead the church in Hildesheim. Randy and Katie Smelser and Amanda Knapp, the American workers in Peine, joined us around a true love feast! And, of course, we talked about Let’s Start Talking! So Thursday from dawn until well after dusk, we talked. We talked and prayed and cried and laughed and dreamed and wondered—because that’s just what Christians do with each other. “I feel betrayed by the people who abandoned their faith?” To overcome this feeling, realize that the feeling is YOURS and stop blaming the feeling on others. These others still love you. Realize that and there is no problem. “Why don’t those other people love me anymore just because I don’t worship with them?” They do love love you. Everyone wants to be your friend. Stop blaming them for your failure to realize this fact. “How can I have a relationship with her when she is still living in sin?” Stop judging her and realize she wants a good relationship with you and enjoy that relationship. To have good relationships you simply need to realize that everyone wants to have a good relationship with you. Are you kidding me, Howard? Do you really think everyone wants to have a good relationship with everyone? There are people who do quit loving other people! Everyone does not want to be everyone’s friend. The world is broken. It is not the way you are describing it and it is not the way God wants it to be either. Your solutions seem to me to always be “take out all the parking meters and you won’t have a parking problem”. But that’s just not true at any level. I appreciate you, Howard, but I just don’t understand the world like you do! Not only do you “appreciate” me, but you wish to have a good relationship with me, to “be my friend.” Is there anyone with whom you do not wish to have a good relationship? There is no such person for me. If you and I want good relationships, how can we assume that the minds of others work differently? I have felt this way for several years and have not encountered anyone who falsified my view that they wish to treat me with love. Granted the test numbers are limited, but if we are ourselves loving and have never met anyone who is not, how can we assume otherwise. In novels and movies (and the bible) people are evil, but in 63 years, I have never met an evil person. If they exist, they are extremely rare. As far parking meters, I have recognize the need for parking meters, traffic cops, policemen, laws and enforcement of norms. I just don’t label as evil a person who drives to fast or otherwise violates the norms. We all do our best and we all, at times, are inclined to test the limits of what society allows, but we quickly recognize what we can and cannot get by with. This is sufficient to behave well and keep the world behaving well. We have no need for, nor justification for a hell.